UPDATE 2: According to Neighborsgo.com, Skinny has been adopted by a veterinarian, and shed six pounds. Once weighing 40 pounds, Skinny gets accustomed to his new digs. 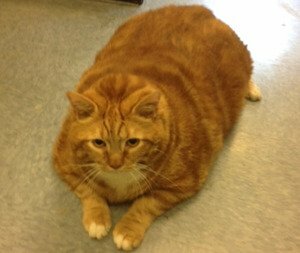 Dr. Brittney Barton, who was overseeing Skinny’s care, adopted the portly feline, who was found as a stray weighing 40 pounds. The cat now weighs 34 pounds; an average cat weighs less than half that amount. Barton has been fostering the animal since early February. “He gets way more exercise at my house,” Barton told Neighborsgo. “He doesn’t have to stay in his ‘apartment’ and he gets regular, daily human interaction.” Skinny should have no shortage of interaction, as he’ll be joining Barton’s husband, three children, a dog, and a second cat in his new family. CatTime salutes Dr. Barton for adopting Skinny. UPDATE: On September 21, CatTime.com reported on Skinny, a 40-pound cat who was left with the Richardson Animal Shelter in Dallas, Texas. Despite hundreds of queries to adopt the rotund feline, shelter personnel have decided to allow a specialized rescue service to have the animal. 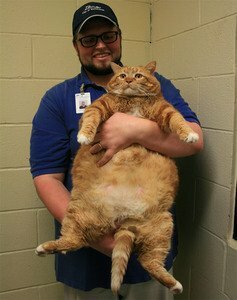 According to the neighborsgo.com, the cat needs the extra special care at a facility that is used to dealing with extremely obese cats. Richardson personnel were also worried that she would be adopted solely for her size and the media attention. The piece also revealed that Skinny is, in fact, a female; early reports claimed she was a neutered male. A 5-year-old tabby cat found as a stray arrived at a Texas animal shelter last week. In a touch of irony, shelter personnel named the feline Skinny; the cat weighs 41 pounds. Skinny weighs approximately 40 pounds; the average housecat is 7 to 12 pounds. The average housecat weighs 7 to 12 pounds. 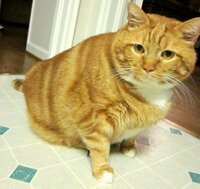 According to The Dallas Morning News, the orange tabby cat has been placed on a diet and exercise program while he waits for a new owner. Skinny is likely to have diabetes, and he has trouble walking because of his immense size. His arthritis also makes movement painful. But Skinny’s situation seems hardly unique. He is the latest in a long line of obese cats being left at shelters, and some — such as Garfield, Sponge Bob, and Meow — enjoyed brief celebrity status while highlighting the dangers of pet obesity (Sponge Bob and Meow died earlier this year). Skinny is available for adoption at the Richardson Animal Shelter in Dallas, Texas.